The amount of oil shipped by train surged nearly 50% in the first half of 2013, putting safety center stage. With U.S. oil production booming and pipelines operating at full capacity, the amount of oil shipped by rail car surged in the first six months of the year -- jumping 48%. And in light of rail's growing importance in bringing oil to market -- and the derailment and explosion of a train carrying oil in Canada earlier this week that killed at least 24 people -- the focus is now on safety. 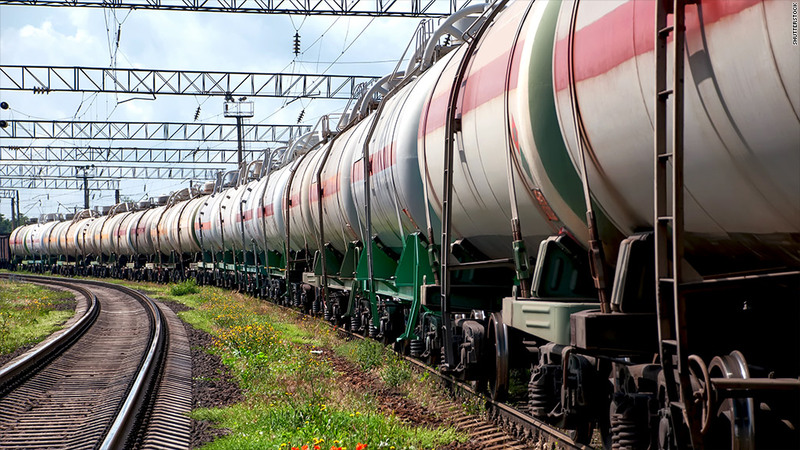 Shipments of oil by rail totaled 355,933 carloads in the first half of this year, according to recent data from the Association of American Railroads. That's up from just 5,358 carloads during the same time period in 2009. The rapid rise in rail oil transport is directly related the boom in U.S. oil production from places such as North Dakota's Bakken Shale and Texas' Eagle Ford. Most of the rail shipments are believed to originate in North Dakota. They are usually bound for refineries along the Gulf Coast or the east coasts of the United States and Canada. Although transporting oil by rail is generally more expensive than moving it by pipeline or ship, the lengthy permitting and construction time frame for pipelines has pushed rail cars into service. Safety: Pipeline operators like to note that pipelines have the lowest rate of accidents of any oil transport method. But the rail industry says that when a spill does happen, pipelines spill far more oil. On a gallons-spilled-per-gallons-moved basis, trains are safer, they say. As a whole, the rail industry has been getting safer for decades. Accidents are down some 40% from the early 1990s, according to Mark Aldrich, a professor at Smith College and author of Death Rode the Rails -- a book on railway accidents. Norfolk Southern (NSC) had the best safety record over the last five years, according to a CNNMoney analysis of Federal Railroad Administration data, followed by Warren Buffett's BNSF, CSX (CSX), Canadian Pacific (CP), Union Pacific (UNP), Canadian National (CNI), and Kansas City Southern (KSU). Union Pacific is thought to handle the most crude oil shipments. Still, there's always more that can be done. More regular inspection to look for broken track may help reduce derailments. Separating train tracks from roads -- by building either bridges or tunnels where the two cross -- would do more to reduce vehicle-train collisions. And the faster implementation of devices to automatically stop trains if they run red signals could reduce train collisions. It's not clear if any of these things would have prevented the Canadian rail disaster. By most accounts, that was a freak occurrence, and the exact cause has yet to be determined, although negligence may be to blame. "I just spent five years studying train wrecks, and this combination of circumstances hasn't happened in modern U.S. history," said George Bibel, a mechanical engineering professor at the University of North Dakota and author of the book Train Wreck: The Forensics of Rail Disasters. He thinks there will soon be an effort to "identify all locations where trains are stopped on hills outside of towns and pay more attention to those circumstances."